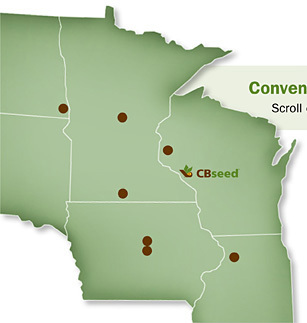 Based in Bay City, Wisconsin, CB Seed offers farmers in the northern U.S. a full line of seed products for corn, soybean and forage production. It is a research-based company, developing high-value conventional and trait hybrids for the unique growing conditions in northern climates. Distributors are located in the Dakotas, Illinois, Iowa, Minnesota and Wisconsin. CB Seed conducts conventional plot trials by gathering yield data in the northern relative maturity zone. This data is also sent for third party testing to organizations like the WI State Yield Trials.